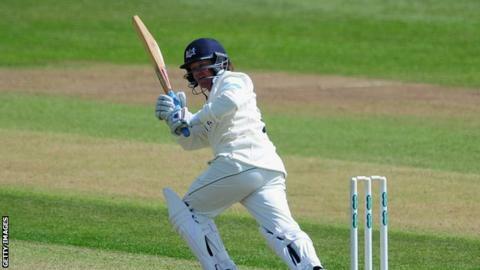 Hamish Marshall's century helped Gloucestershire recover after a disastrous top-order collapse on day one against Kent at Canterbury. The visitors slumped to 14-4 as Mitch Claydon (3-73) and Darren Stevens (3-60) each struck twice to dismiss the top four batsmen for only nine runs. Gloucestershire rebuilt with an 87-run stand for the fifth wicket between Marshall and George Hankins. After Marshall was caught off Claydon for 112, the away side closed on 296-9. Jack Taylor's impressive start to the year with the bat continued as he made 52 in a century seventh-wicket stand with Marshall, before the pair were dismissed in consecutive overs in the final session of play.